I recently visited the 64 Yoginis Temple at Hirapur, near Bhubaneswar in Orissa (India). What we find near the gate is a summary on the temple put up by the Archaeological survey of India and it goes like this- Locally known as Mahamaya Mandir, this hypaethral shrine facing the east was discovered in 1953 by Kedarnath Mahapatra of the Orissa State Museum. The circular shrine, measuring 27.4 m in circumference and 2.4 m in height, having frontal projection, resembles a Gauri-patta in appearance. Made of locally available coarse sandstone, it harbours images of Yoginis standing on different mounts, postures, and each exhibiting a distinct coiffure. The image of the ten-armed presiding deity of the pitha, worshipped as Mahamaya is the largest among the Yoginis. Whereas in the centre, exists a lately restored Chandi Mandap displaying four shaivaite figures and yoginis, the entire delicately carved imagery notable for feminine beauty is carved in Chlorite brought from elsewhere. The projected niches on the exterior of the edifice are studded with icons of Nava Katyainis made of sand-stone. It is assignable to circa ninth Century A.D.
After going through the same, I did not know what to expect. I took in all the sights from the compound. There was a village pond outside the compound. 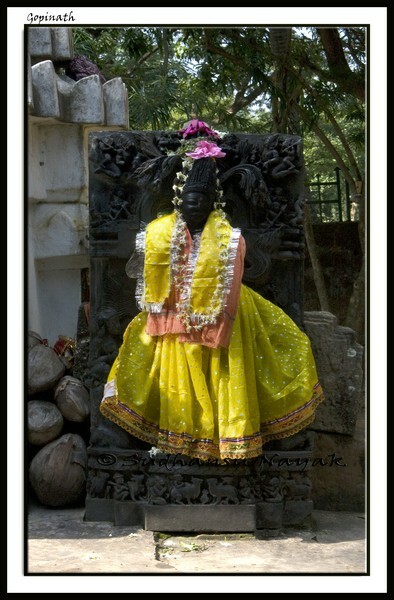 A small temple near the gate had a statue of Gopinath (one form of Lord Vishnu) make of black Chlorite and there was a circular stone structure towards the northern side of the compound. As I moved closer to the temple, I saw a circular stone structure with a single door made of laterite. I took a stroll on the outside perimeter before entering the inner sanctum. Once I entered, I was almost taken aback from the structure of the temple. It was a temple open to the sky, with a small platform in the middle with four pillars. The inner perimeter wall had small Yogini statues made of black Chlorite. I was suddenly surrounded by Yoginis on all sides and had a strange feeling. I had never seen anything like this before. The time spent was worth it and induced me to do extensive reseach on the topic. I am sharing the details on the 64 Yogini Temple. This historical site is a must-see during one's lifetime and I am glad that I have. How to reach there: There are two approach roads to the temple, both converging some 500 mtrs away from the temple on a semi-tarred road. a) Road 1: Keep going on the Bhubaneswar – Puri Road. Once you see Dhauli Stupa, keep an eye on the left side. There is a distinct board showing the road directions. b) Road 2: This is a more convenient route. Take the Tankapani (pronounced as Ton-co-pany) Road from Ravi -Talkies Square (RTS). Keep going straight to Gangua (also called Bhargavi by some accounts) river (This would come after you have crossed Rajarani Temple on the right-600 mtrs from RTS, Bhaskareshwar Temple on the left-3 or 4 Kms from RTS on the left, Megheshwar Temple-5 Kms from RTS on left, Sai Temple-7 Kms from RTS on left and another 2 to 3 Kms through the fields). Cross the bridge over the river and take the immediate right. Keep following the road signs or ask locally for the temple. What time to go there: Go around 0900 hours IST. This is the time when the morning Pujas would be over and the people would be there to guide you. Non-monsoon time of the year is good. Avoid the monsoons. There is a pond nearby which gets flooded during the monsoons. Even the Gangua River gets flooded during the monsoons if the downpour is heavy. Durga Puja time would be crowded. If you are a photographer: Carry an Ultra Wide Angle lens and a Circular Polariser. A 4 GB card would be handy, if u intend to capture all the Yoginis and the surroundings. 1. Type of Temple: First of all why is it called a Hypaethral temple. Hypaethral Temple is an ancient temple with no roof. (From the Latin hypaethrus, from Ancient Greek hupaithros hupo- under + aithr, sky, air.) It has instead a hypaethros or hypaethral opening. It was described by the Roman architect Vitruvius in his treatise “On Architecture” written for the emperor Caesar Augustus probably about 15 BC. This term is in distinction from cleithral, which is covered with a roof. 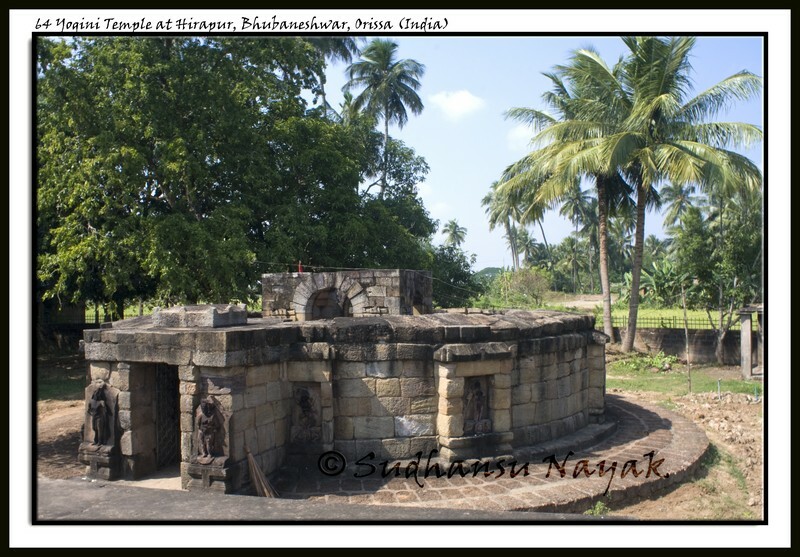 2. Who built this temple: Some suggest that the Yogini temple at Hirapur was commissioned by Queen Hira, consort of Shanti-Kara II, and that the village was named after her. Why a queen and whats the significance of the socio-cultural setup then is what intrigued me. As per the then religious beliefs, Lord Vishnu consorted with Bhumi, Goddess Earth and a son was born. He was called Naraka, also called Bhauma. That the identification of the son was done from the maternal side suggested strong Matriarchal society. Orissa was ruled by the Bhaumakara Dynasty between 736-950 A.D. and during this time, 6 queens ruled the region with full powers and all sovereign rights, where the lineage was passed from mother queen to daughter queen. (In fact, in Agni Purana, one of the later Bhaumakara kings cited that he was the descendant of Bhagyadatta, son of Naraka and a yavana-meaning a foreigner). During the initial part of their rule, Mahayana Buddhism was almost the state religion, yet members of their dynasty showed great tolerance towards Brahmanical Hinduism and ultimately they became hindus. This period of Orissan history was marked for the gradual incorporation of tantrism into both Buddhism and Hinduism and by the rise of tantric cults in the region (Brighenti 2001, 89). Although the religious policy pursued by the Bhauma-kara kings and queens during their two centuries of rule over Orissa was aimed at conciliating tantric Buddhism, the dynasty's original faith, with Brahmanical Hinduism, their predilection would appear to be for the heterodox left-handed (vamacara) tantric. The presiding deity of some of the major temples built in Bhubaneswar under their patronage was the terrible Camunda, connected in all probability with the occult blood rites typical of the Kapalika sect. The influence of tantric Buddhism upon Brahmanical Hinduism was probably more strongly felt at Jajpur, the center of power of the Bhauma-kara kings, than at Bhubaneswar. Jajpur was a pilgrimage center, the site of the shrine of Viraja, the oldest and most eminent goddess in Orissa, whose worship was documented in the great Indian epic the Mahabharata (third century B.C.E. to third century C.E.). Located near the important monastic teaching establishments of tantric Buddhism in the nearby hills, the rituals at Viraja must have been influenced by their practices. Vajrayana Buddhist and Hindu tantric iconographies and rituals from this period appear to be too closely entangled to even begin to discern who influenced whom. What we can determine at this stage of our inquiry is that both were part of an emerging, influential tantric cultural climate in Orissa. (Gadon, Elinor W., 2002, Probing the mysteries of the Hirapur Yoginis) . 3. 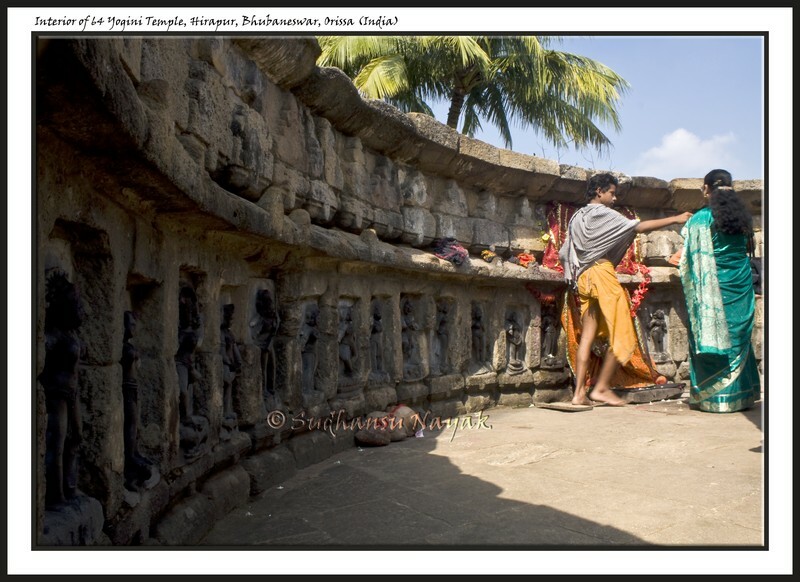 Temple Structure and details: There are sixty yoginis on the inner wall oblong niches encircling the devi mandap. The largest statue is that of 'Mahamaya'. The mandap is adorned with 4 chlorite statues - on the southern side, two statues of ten-armed "Swacchanda Bhairava" (Blissful fearsome Shiva) and on the eastern side, the four-armed "Ajaikapada Bhairava" (Shiva standing on one leg), and one statue of ten-armed Swacchanda Bhairava all with urdhvalinga (erect phallus or idyphallic). The western and northern faces of the mandap contain three more chlorite yoginis. 61st of the original 64 yogini statues is missing and I found no record on the same as I write this report. The outer walls are adorned with 9 Katyayanis. Katyayani, as per Skanda Puarana, is the the mother of Skanda. So the 9 katyanis are 9 different forms of the Mother goddess. 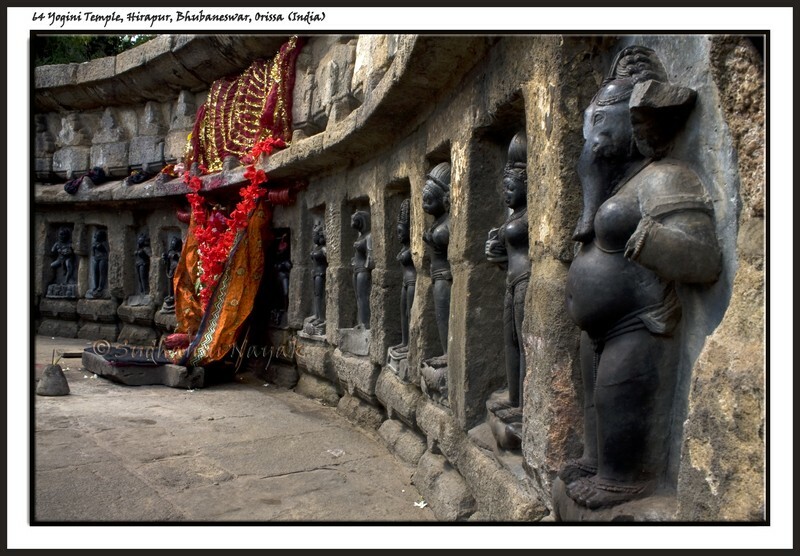 On the entrance, there are two statues on the inner walls, and are identified as Kala and Mahakala. This part, I am not sure of because Kala and Mahakala, are understood to be the energy forms of Lord Shiva. (I shall try and throw some more light when I discuss each of the energy forms in detail) .There is a multi-purpose stage outside the temple. 4. Why 64 Yoginis:This part was pretty intriguing. Why 64 and not any other number? Some immediate thoughts that came to mind: Double helix has a 64. Kamasutra has 64 positions. After detailed research, some pointers made the picture slightly clearer but nothing can be clear 100% because of lack of any documents from that era that I can refer to. It was said that the tantric traditions were so hush hush and sometime grotesque, that it instilled fear in the common man. And as the brahmanical hinduism took centerstage, many of these documents were either hidden or destroyed. Now coming to points of reseach and why 64: The symbol of number 64 is a product of 8 directions and replication of each one in the asthamandala/ asthaka-cakra (eight points on the cosmic circuit). This theoretic or esoteric interpretation is explained in the Agni Purana, AgP (52; 146) that prescribes that one goddess must preside overe ach group of the 8 goddesses. The primordial number of eight matrikas (mother goddesses) symbolises the condensation (sankoca) of the cosmic rhythm, and the number 64, resulting to the emergence of the matri-chakra or matrimandala represent its expansion (purna vikas). This pattern is clear by the geometrical arrangement of the 64 Yoginis. Thus, the number eight and sixty-four are the two phases of creation. Following the framework of the AgP,4, the placement of 64 Yoginis would be arranged into an Eight-petal (lotus) Yantra where each petal places eight forms of Yogini. Each of the petals is ascribed to a specific direction; and each direction is under the control of one of the eight forms of Matrikas : Brahmi (east) , Maheshvari (southeast), Kaumari (south), Vaishnavi (southwest), Varahi (west), Aindri (northwest), Camunda (north), andNarasimhi (northeast). The identities of Yoginis and their characteristics are not very clear, however most of them are place-specific or task-specific. I found that there are atleast 6 such lists of yoginis all with different names of 64 yoginis but all of them stressing the singular point that all of them are forms of the Great Goddess. Similarly, there are 8 groups of 8 Bhairavas making the total number of 64 Bhairavas as per the puranas (hindu vedic scripts). In my next blog, I will try and discuss the details of the 64 yoginis and the bhairavas with images. My blogger in --''Tamil'' --is non commercial one and I keep writing articles in Tamil on divine after retirement. Will you kindly permit me to use the Yogini photos and some content from your site for my article yogini temples. Of course I will give due acknowledgment to your site for the photos used. Wonderful blog & good post............Vedic Architects & Sculptors is the leading the Hindu temple builder specializing in Vastu science for contemporary buildings, Temple Vigraham in Stone and Stone carving architecture in Chennai. A big Thanks for posting this great blog which is quite informative. I have just visited the temple. I regret not having spent more time looking, understanding, documenting. Have you written any other post on the yoginis? The number 64 represent the aspects of the human psyche. I visited here with a Kriya monk from Hariharanada Gurukulum years back. He explained the pooja system they used and that each yogini represents a chakra petal. Unfortunately that doesn't quite add up in the standard chakra system. It was only after an exhaustive search through laya yoga that I come to undertand the system completely, and why there are Yoginis at the centre. Beautiful Description and brief too. What keeps shaping me sums up by the saying of two greats. 1. Why: "When you discover what you will be in your life, set out to do it as if God Almighty called you at this particular moment in history to do it. Don't just set out to do a good job. Set out to do such a good job that the living, the dead or the unborn couldn't do it any better...Sweep streets so well that all the hosts of heaven and earth will have to pause and say: 'Here lived a great street sweeper who swept his job well.' ..............Be the best of whatever you are" (Dr. Martin LutherKing Jr)*** 2. How? "My dear fellow, who will let you?" "That's not the point. The point is, who will stop me?" (Ayn Rand) * * * * ** * * * ** * * * * Travelling and trying to take in as many hues of life, gives me a sense of satisfaction. I don't know how to define passion but I know for sure that this has been and will drive me till the time my body turns into ashes on the shores of Puri Beach.